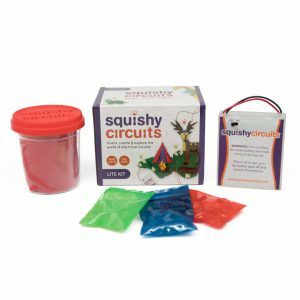 Combines the power of Arduino with the Squishy Circuits kit. You can create your own programs or use one of the many online guides or tutorials. Make your own dough based game controller or even a lighting and sound system. Crazy Circuits parts are LEGO compatible and similar brick building systems. The parts come 100% ready to go out of the box, which means no soldering or preparation required. 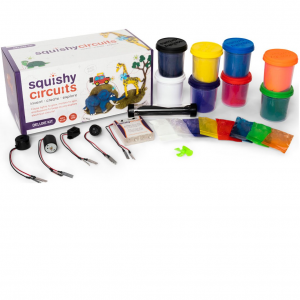 The Touch Board and USB cable gives you the ability to turn Squishy Circuits dough into interactive programming project. Detailed directions, project guides, educational resources, and videos are readily available. You will receive a link in your receipt that will take you to our data base.